J. Jane Consulting | molly herrmann. minneapolis, minnesota | chef caterer. wife to super hubby. mom to budding food critic & owner of kitcheninthemarket.com. I keep up with this creative genius on Facebook and Twitter. Not only is Molly Herrmann a wife and mother, she is also a talented chef, food critic and small business owner in Minnesota. Most notably, Molly has an energy that seems to permeate through the computer screen. (If only her creativity would seep into my brain. Wouldn’t that be a fun and useful world wide web trick? Figure that one out, would you Luke Stepleton?) It has been fun to watch Molly’s career blossom over the years, and if you begin to follow her on Twitter and Facebook, you will understand why her popularity continues to grow. As the j. jane holiday series continues, take a short break from gift wrapping, grab a cup of hot coffee, and enjoy this j. jane highlight. Happy Holidays! Definitely an organic progression. My career started in nutrition, morphed into personal chef work, then catering. Opening Kitchen in the Market (a shared commercial kitchen space and cooking school in Minneapolis) was a result of following that culinary path. Who knows where it will lead next! Owning and operating a small business. It is at the same time the best and worst thing I’ve ever done. I can’t imagine doing anything else, but it definitely brings out all of your strengths AND weaknesses. Everyday. I try to surround myself with talented and enthusiastic people. I have to remember to step back from the day-to-day work that a small business requires, and get back in the kitchen. Cooking and teaching classes, interacting with folks in our kitchen is what fuels my passion. It always recharges me. Would you share one of your favorite party appetizers recipes with j. jane readers? This recipe never fails to impress and is super easy. We serve it as a mini fish taco station for catering. Just use a small cookie cutter to make bite-size tortilla rounds. Put out some lemon wedges and store bought harissa (or make your own), and let folks make their own tacos! Gently blend egg whites and kosher salt in a large bowl until moist and moldable, adding water as needed for desired consistency. Place 1/3 of salt mixture onto oven proof platter or baking sheet; place fish atop salt mixture. Season with salt pepper and desired seasonings. Stuff cavity with fresh herbs and lemon or lime rounds; close fish. Cover entire fish with salt mixture and pat down until firm. Bake in oven for about 40 minutes. Remove and let stand for another 10 minutes. Break salt crust and remove from fish; discard herbs and lemons. Serve immediately or refrigerate for cold fish. You will always be learning. And I am. We bring in so many wonderfully talented chefs, and they never fail to teach us something new. Or we are even discovering new ways to do something ourselves. Just yesterday, I was supposed to be rolling out some gluten-free pizza dough between 2 sheets of parchment. In a moment of clarity, I used a cardboard pizza round to just press it flat into shape. My sous chef + I were both like, “Why didn’t we think of this before?” It seems so very simple, but that kind of stuff happens all the time. We’re constantly tweaking, improving, experimenting and trying to be more efficient. Dream bigger and start earlier. What is your best advice on how to be a graceful chef & host during a holiday party? Don’t be afraid to ask guests to bring something, because they usually want to anyway and this way you can ask for something specific. Don’t be afraid to put guests to work! Most folks love to help pitch in, and it gives them more time with the host. Don’t overload the buffet with too many choices. Keep the offerings to 5-6 items. Any more than that is too much prep time & too many choices for the guests. Batch your cocktails if you don’t have a bartender. Saves time for everyone. And of course, hiring a caterer takes all the stress away! HARISSA Recipe – Just in case you want to make those tasty fish tacos. I had no idea what that was … I really need to get out more. 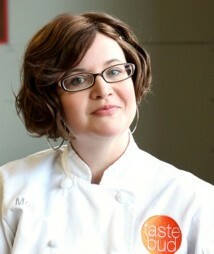 Be sure to check out Molly’s website at Taste Bud Tart and connect with her on Facebook and Twitter.